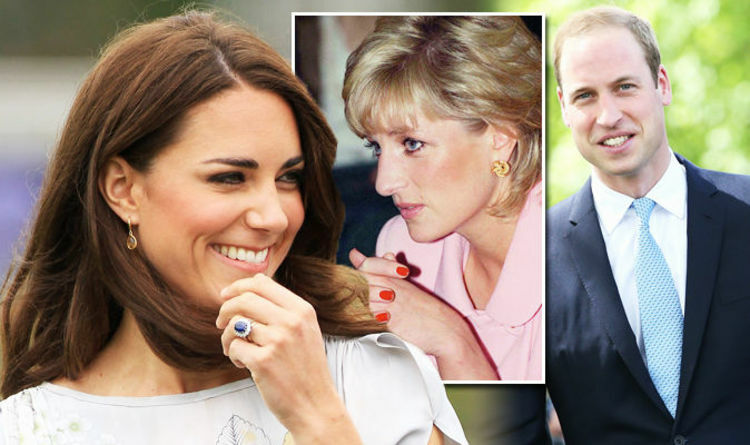 Kate Middleton and Prince William engagement anniversary – how much is Diana’s ring worth? Yesterday marked the eight year anniversary of the day it is believed Prince William proposed to Kate Middleton. William got down on one knee at Rutundu Cabin at the foot of Mount Kenya. The romantic Prince proposed with a very special ring, one that belonged to his mother Princess Diana. When the late Diana and Prince Charles, 69, became engaged the future Princess of Wales picked the Garrad’s ring from a catalogue. It was a huge sapphire stone ringed with ten sparkling diamonds, and was groundbreaking at the time. While royal engagement rings were typically designed in a bespoke fashion by a royal jewellery, choosing a ring from a catalogue was unprecedented. Prince Harry, 33, and William reportedly agreed that whoever became engaged first would use the ring. It happened to be that Prince William was the first to become engaged, so the stunning ring was given to the heir to the throne’s University girlfriend. So, how much is Kate Middleton’s ring worth? When it was first purchased in 1981 the jewel cost £28,500, which is around £100,252.37 in today’s money. However, according to experts the ring is worth far more than that today. The ring has been valued at £300,000 by experts. Princess Diana stopped wearing the ring after her split with Prince Charles, but she replaced it with another stunning ring. She replaced the ring with an aquamarine and diamond ring, which Meghan Markle wore to her wedding reception in May. Grant Mobley, a gemologist and Director at Pluczenik, one of the world’s leading diamantaires said: “A beautiful ring that Princess Diana was seen wearing on her ring finger after her divorce from Prince Charles was an emerald cut, aquamarine and diamond ring. Kate Middleton recently hosted a surprise event for inspirational teens in £2,095 outfit. The Duchess of Cambridge wore the Margot Dress, £150, Whistles – a pretty brown and white spotty number. She paired her high street buy with a pair of £1495 earrings by Cassandra Goad, and suede pumps, £450, by luxury Italian shoemaker Gianvito Rossi.